The text is a poem by Rumi. Text pages are paste-painted. The lettering was done in a small running hand (x-height about 1/10"=25mm) with a Mitchell #6 nib and Schmincke metallic gouaches. The covers are mat board covered with a black silk chiffon and scraps of metallic marbled paper. The fasteners are drilled stones, gold beads, narrow ribbon. 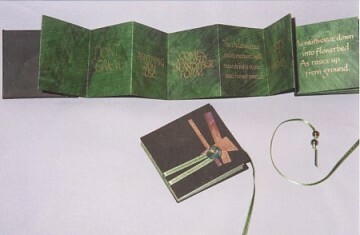 Book 2½" x 2-5/8" (6.4cm x 6.8cm).